For more than 3,000 years, civilizations in every corner of the world have documented the powerful effects that herbs, plants, roots, tree bark, leaves and flowers (the botanicals) have on human well-being. Intra combines this ancient knowledge with advanced science to create a nutritional beverages geared to today's lifestyles. 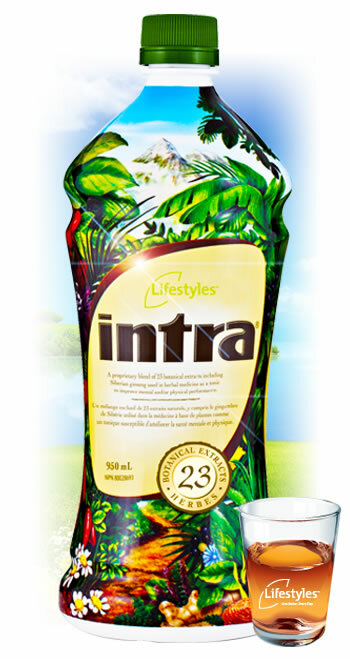 Intra's unique formula is exclusive to Lifestyles and has remained unchanged since 1992. Intra's precise formula of 23 botanical extracts work better together to help balance and strengthen the body's eight biological systems, leaving you feeling healthier, happier and more energized! Intra is certified Safe for Athletic Use by the international Olympic Committee because it does not contain steroids or stimulants.